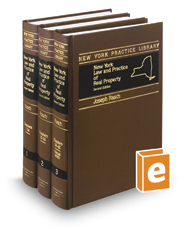 New York Law and Practice of Real Property has been designed to give you a useful and practical book on the subject of real property in New York. It provides fundamental principles of law and demonstrates how they can be coordinated and used to solve the day-to-day real property issues you face. Topics include incidents of ownership, marketable title, contracts for sale, deeds, closing of title, rights of adjoining landowners, mechanics liens, mortgages and foreclosures, action to quiet title, easements, eminent domain, cooperatives and condominiums, and trusts.